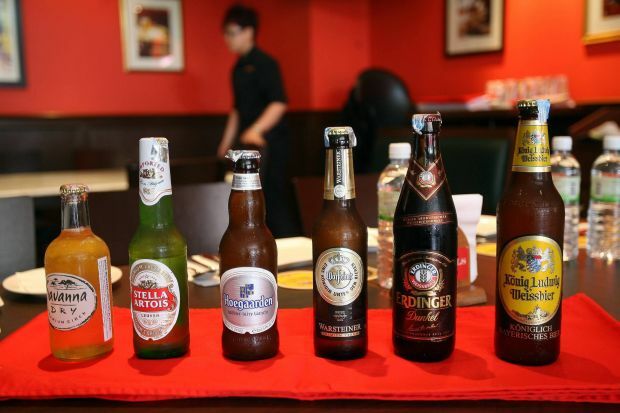 SPECIAL dishes cooked with beer will be introduced exclusively at Brussels Beer Cafe in Solaris Mont Kiara this month as part of the Guest Chef Visit programme by supplier Luen Heng F&B Sdn Bhd. The right way: Kern showing the chefs how to prepare the two special dishes. The programme, which is meant as an additional support for the company’s customers, will see master chef Jochen Kern heading to a different restaurant each week to show chefs how to prepare two exclusive dishes. “The key to cooking with beer is to balance out the bitter taste it has. However, a bit of bitterness makes a dish or drink more exciting and in the end, it should still taste like beer,” said Kern. The first dish was the Konig Ludwig Steak Salad featuring a medium rare 100g sirloin steak. 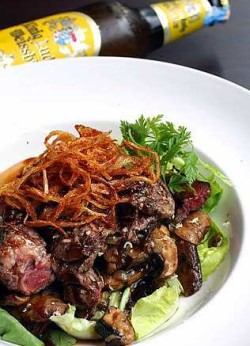 Kingly ingredient: Using the beer of kings, the Konig Ludwig Steak Salad is described by Kern has having a crowning glory of mushrooms and crispy onions. “The Portobello mushroom is sliced and cooked with the Konig Ludwig beer, ginger, garlic and some olive oil. The onion is fried till crispy with some salt, pepper and paprika, making it somewhat reddish-orange in colour,” he said. The salad was made from butterhead lettuce, tomato and arugula laid at the bottom of the dish followed by the mushroom and steak on top before it was drenched in a dressing made from balsamic vinegar, honey and some beer. Following that was the Pork Emince in Erdinger Dunkel dish that saw a hearty combination of potatoes and pork. “The pork meat is shredded into bite-sized pieces and cooked in a sauce of Erdinger Dunkel, a dark beer, together with mustard and cream that balances out the bitter beer taste,” said Kern. The meat was served on top of a hash brown made of shredded potato, a Switzerland traditional dish. Kern’s advice for people who were going to serve and cook with beer was to use different ones. “Serve a beer you are not using in your dishes. So your guests will not feel like they are tasting the same thing the whole night,” he said, adding that doing so would make the host appear more professional and impressive. Another thing to keep in mind when serving and cooking with beer is not to serve a beer that is stronger than the food. “Similar to wine, a stronger flavour or dark beer should be paired with meat dishes like pork and beer whereas something lighter goes with fish and lobster,” said Kern. 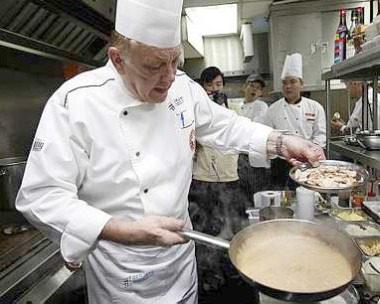 Kern, who is Berjaya University College of Hospitality’s school of culinary arts director said though the recipes were not his creation, he knew how the dishes would taste just by looking at them because of his 45 years of experience in the kitchen. The price of each dish is RM50++ which includes a 500ml draught of Konig Ludwig Weissbier or 500ml bottle of Erdinger Dunkel while a la carte orders of the dishes are priced at RM25.80++ each. The promotion is available from 6pm to 10pm.